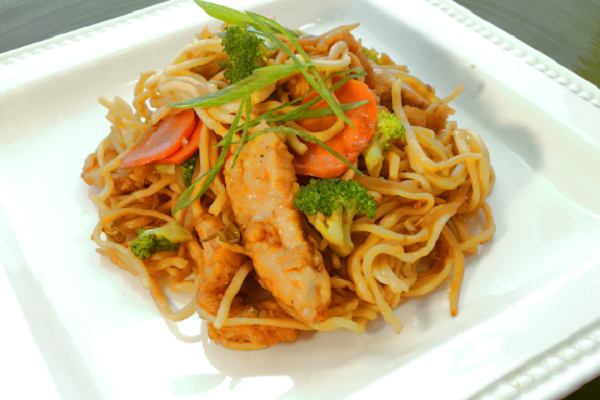 Our chicken and vegetable stir fry is a great option for a healthy weeknight meal that incorporates ample amounts of crunchy bean sprouts, broccoli and carrots. Quick and easy to prepare in under 10 minutes. Noodles: Place noodles in boiling water for 5 minutes or to desired tenderness. Drain water and set aside. Chicken: Coat a pan with vegetable oil and preheat med. high. Coat chicken in corn starch, shake off excess and saute for 4 min. or until cooked through stirring occasionally then set aside. In same pan, add 1-2 tablespoons of vegetable oil and saute vegetables for about 2 min. Add 1 tablespoon water per serving, stir then cover for 2-3 min. Add sauce and cook for 30 sec. 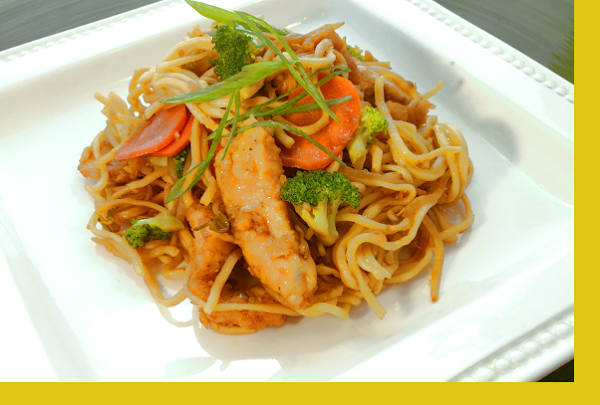 Add chicken and cooked noodles, stir thoroughly then serve. Even my toddler loved this dish, the cook time wasn't too intensive and I was able to do it on my own. Hubby did have to entertain our daughter but dinner was on the table in 15 min - you can't beat that! My daughter only ate the noodle but we were able to sneak some sprouts in there for some bonus veggies! Similar to flavors from restaurants. Very quick and super easy to prepare. So so so good. The chicken and veggies were nicely seasoned. How did you know I love Lo Mein Maria? You must be a mind reader. Confucius says Keep up the good work. This was delicious! Super easy to cook and tasted way better than what I would have got any where else! Super easy and quick to prepare. Flavors were delicious and comparable to something you'd order from a restaurant. Portions were big - enough for my husband and I to eat off of it twice. We'll be ordering this one again and again!